Media Converters There are 9 products. 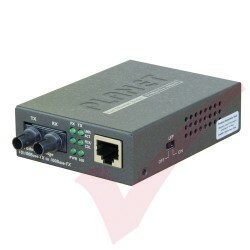 10/100-100FX (SC) LFP MM PLANET FT-802 is a Fast Ethernet Bridge 100Base-FX fiber to 10/100Base-TX shielded twisted pair (STP) converter. 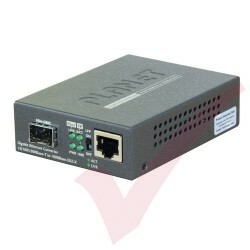 It supports both half-duplex and full-duplex operations and a variety of fiber options. The converter auto-adapts to the highest level of performance supported by the device connected to the STP port. 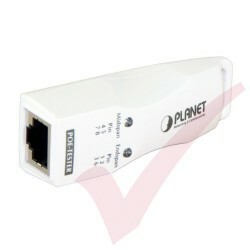 PLANET FT-801 is a Fast Ethernet Bridge 100Base-FX fiber to 10/100Base-TX shielded twisted pair (STP) converter. It supports both half-duplex and full-duplex operations and a variety of fiber options. 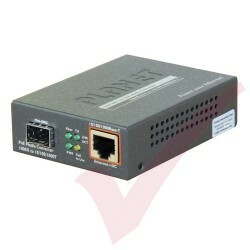 The converter auto-adapts to the highest level of performance supported by the device connected to the STP port. The GT-80x series provides auto MDI/MDI-X on its TP port and the DIP switch to configure the Link Fault Pass through function (LFP). The LFP function includes the Link Loss Carry Forward (LLCF)/Link Loss Return (LLR). LLCF/LLR can immediately alarm administrators the problem of the link media and provide efficient solution to monitoring the net. Fast Ethernet Bridge 100Base-FX fiber to 10/100Base-TX shielded twisted pair (STP) converter. It supports both half-duplex and full-duplex operations and a variety of fiber options. The converter auto-adapts to the highest level of performance supported by the device connected to the STP port.